An Indigenous Biennale? at News Aboriginal Art Directory. View information about An Indigenous Biennale? Well, do we have an Indigenous Sydney Biennale or not? The third oldest Biennale in the world (after Venice and Sao Paulo) has begun to announce its artists selected for next year – opening on March 14th. Along with the declaration of 33 names by Artistic Director (and Indigenous artist) Brook Andrew, we were introduced to newly appointed Indigenous board member Josie Cashman. This dynamic Warrimay woman (from the Maitland/Hunter River district) told us we were going to have “a global Indigenous Biennale". And in confirmation, Brook Andrew revealed that the whole shebang was going to go under the Wiradjuri name, 'Nirin' – meaning 'edge'. No, not the periphery sort of edge; more the cutting sort of edge. 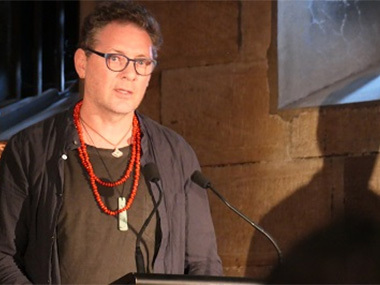 And, this being the International Year of First Nations languages, Andrew has added sub-divisions from his Wiradjuri heritage: Dhaagun – earth, sovereignty and working together; Bagaray – healing; Yirawy-Dhuray – yam connection and food; Gurray – transformation; Muriguwal – different stories; Ngawaal-Guyungan – powerful ideas and the power of objects; Bila – river and environment. Summing up, Andrew declared that “2020 was going to be a year of collaboration after 170 years of frontier wars, whose histories need to be told. For the planet is at breaking point”. But Andrew admitted, "the Biennale of Sydney can't do everything that needs to happen in 2020”. So far, the burden of this telling from the 20th Century frontiers seems to fall on the brilliant Mulka Project from Yirrkala in north-east Arnhemland. The other Australian Aboriginal artists involved – Tony Albert, Barbara McGrady, SJ Norman and Sydney's Blacktown Native Institution - all seem to come from the urban south. But the exoticism of the names of international artists from such rarely appreciated countries such as Haiti, the Congo, Peru, Jordan and Ghana suggested that the Artistic Director might have been intentionally trawling the Indigenous world. He was quick to deny that: “That exoticism is simply in the European eye”, he reminded me. “But I'm Indigenous, so that's bound to flavour the Biennale”. · Tony Albert Born Australia. Based in Sydney, Australia. · Maria Thereza Alves Born Brazil. Based in Berlin, Germany. · Lhola Amira Born South Africa. Based in Cape Town, South Africa. · Sammy Baloji Born Democratic Republic of Congo. Based in Brussels, Belgium. · Huma Bhabha Born Pakistan. Based in Poughkeepsie, USA. · Blacktown Native Institution Dharug Nation, Australia. · Anna Boghiguian Born Egypt. Based in Cairo, Egypt, India and Europe. · Eric Bridgeman Born Australia. Based in Brisbane, Australia and Papua New Guinea. · Victoria Santa Cruz Born Peru (1922-2014). · Léuli Eshrãghi Born Australia. Based in Melbourne, Australia. · Jes Fan Born Canada. Based in New York, USA and Hong Kong, China. · Nicholas Galanin Born USA. Based in Sitka, USA. · Fátima Rodrigo Gonzales Born Peru. Based in Lima, Peru. · Lawrence Abu Hamdan Born Jordan. Based in Beirut, Lebanon. · Arthur Jafa Born USA. Based in Los Angeles, USA. · Hannah Catherine Jones Born United Kingdom. Based in London, United Kingdom. · Bronwyn Katz Born South Africa. Based in Johannesburg, South Africa. · Mayunkiki Born Japan. Based in Hokkaido, Japan. · Kylie Kwong Born Australia. Based in Sydney, Australia. · Barbara McGrady Born Australia. Based in Sydney, Australia. · Ibrahim Mahama Born Ghana. Based in Tamale, Ghana. · Teresa Margolles Born Mexico. Based in Mexico City, Mexico and Madrid, Spain. · Misheck Masamvu Born Zimbabwe. Based in Harare, Zimbabwe. · Katarina Matiasek Born Austria. Based in Vienna, Austria. · Jota Mombaça Born Brazil. Based in Berlin, Germany, Madrid, Spain and Sao Paolo, Brazil. · Prof Sir Zanele Muholi Born South Africa. Based in Johannesburg, South Africa. · The Mulka Project Yirrkala, Australia. · S.J Norman Born Australia. Based in Berlin, Germany, London, and Melbourne, Australia. · Taqralik Partridge Born Quebec, Canada. Based in Kautokeino, Norway. · Laure Prouvost Born France. Based in London, England and Antwerp, Belgium. · Lisa Reihana Born New Zealand. Based in Auckland, New Zealand. · Latai Taumoepeau Born Australia. Based in Sydney and Melbourne, Australia. · Gina Athena Ulysse Born Haiti. Based in Connecticut, USA. 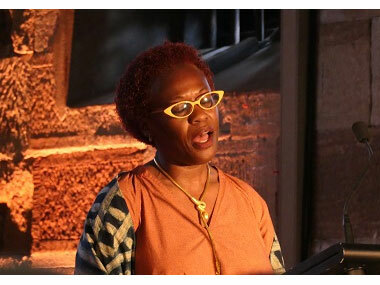 Both Gina Ulysse and the Samoan-Persian-Australian Leuli Eshraghi performed works in their languages – suggesting a highly performative 22nd Biennale of Sydney. Strangely, though, the very performative Carriageworks has been dropped from the venues showing the show. The Art Gallery, Artspace, the Museum of Contemporary Art and Cockatoo Island continue to be joined by the National Art School in Darlinghurst.